More than 610 million members in over 200 countries and territories. More than 20 million open jobs. More than 30 million companies. So whether you’re looking for new leads or a new job you need to be on board the LinkedIn train. Melonie Dodaro has been helping people with digital sales and marketing since before social selling was even a thing. In her bestselling book, LinkedIn Unlocked: Unlock the Mystery of LinkedIn to Drive More Sales Through Social Selling, Dodaro has written a comprehensive guide to learn how to really used LinkedIn. You’ll optimise and systematise your efforts on LinkedIn to achieve repeatable and predictable results. Lead Generation. Identify and connect with the right prospects. Importantly you must engage with them regularly to move those conversations offline. Create a social selling playbook to systematise your strategy . Conversion. Close the sale, measure results and assess performance to improve results. There’s a number of exercises to get clear on your objectives and what success on LinkedIn looks like for you. The book explains how to create an ideal customer profile, uncover the problems they face and how to align your solution with those pain points. Your LinkedIn profile is the cornerstone of your strategy. It must be compelling, current and crystal-clear to your target audience who you are and how you can help them. The book explains every section of your LinkedIn profile and how to optimise it. There’s no stone left unturned and you’ll refer to these chapters again and again as your profile evolves (Dodoro recommends you update your profile regularly to keep it fresh and relevant). I appreciated the advice on how to ask for recommendations. I’d only ever thought about asking colleagues, but the book shows you a variety of situations in which you could request a recommendation from your network. I’m really excited about implementing her suggestions. Your LinkedIn profile must be 100% client focused. Show that you want to know what their problems are and that you can offer a solution. If you understand where they’re coming from, what their motivations are, and if you speak their language, you’ll be able to connect to them in a meaningful way. 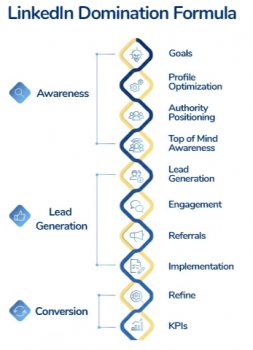 The LINK Method™ is a social-selling framework to reliably increase your authority, get more leads and clients and close more sales. Look for prospects. A power users guide to using search to find relevant prospects and expand your network. Initiate a connection. Best practices when you make a connection request. The emphasis is on personalisation and there are many templates and examples included to show you the best way to grow your network. Nurture relationships. Establish rapport in the welcome messages you send to new contacts and continue to engage by sharing helpful content to build trust and credibility. Kick up the conversation offline. Explains how to learn more about your networks’ challenges and earn the right to move the conversation offline which is where the sale happens. It’s a simple, yet powerful system that the remainder of the book explains how to implement. The book discusses at length the importance of sharing relevant content that helps your network and demonstrates your expertise. Should you create or curate content? What type of content should you share? How do you get engagement? Dodoro explains it should always be high quality and either informative, helpful or entertaining (or all three). Consistency is important and she shares a detailed guide and resources to help you create a content marketing strategy that works for you. The chapters dedicated to content marketing have more than enough information to get you started but not enough to keep you going (it is, after all, a book about sales not content marketing). If you want to explore content marketing further, I recommend Practical Content Strategy & Marketing by Julia McCoy. One of the easiest ways to build authority, credibility and trust is by creating and sharing content that is valuable to your ideal clients. When you are perceived as a trusted authority you become the first choice in the minds of potential prospects when they look for the solution to solve their problem(s). LinkedIn maybe an online platform but you can still build quality professional relationships if you decide to invest the time. The book examines the power of personalisation and says automation is not the way to approach business. I agree and feel that social selling has led to people thinking they can put lead generation and sales on auto-pilot and conduct business by messenger. Not so. People still buy from people and Dodaro makes that very clear. liked, commented or shared your posts. In addition, there are message templates for these events to kick start your conversations. I believe when you stop collecting connections and start building relationships, you increase trust, credibility and attract more clients. Stop collecting connections, it’s time to build relationships if you want to succeed with LinkedIn. One of the most compelling discussions in the book is on being intentional and committing to your network. Dodoro advocates an abundance mindset and sharing your knowledge freely. In return you’ll be rewarded with a quality network that trusts you and people that are ready to do business with you. Ethics are important to Dodoro and she discourages deceptive tactics like false scarcity, fake testimonials or recorded webinars pretending to be live. She says to define your values and be guided by them when using LinkedIn. Your online persona should be authentic to who you are in the real world. People can quickly sense when your intention is self-serving, and this will repel people. Conversely, the opposite is also true; you will attract those people to you who resonate with your core intention or commitment. These are the people who want and need what you are offering. Three bonuses are included with your purchase of LinkedIn Unlocked. 10 minutes on Melonie Dodaro – who she is and her background. 5 minutes on why LinkedIn. 5 minutes on what will be covered in the webinar. 10 minutes on what not do do on LinkedIn. 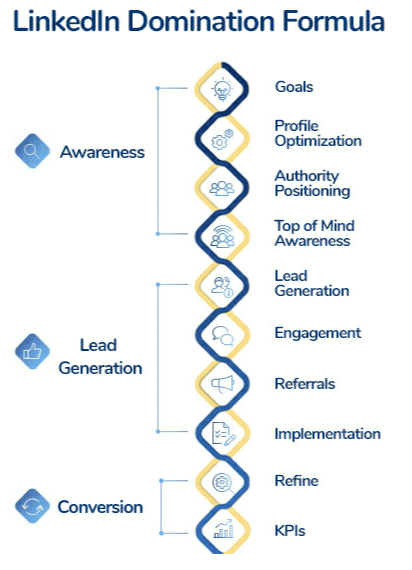 20 minute guide through the LINK Method (find prospects, send a personalised connection request, send a follow up welcome message, share relevant content to their industry, move the conversation offline). 10 minute pitch for Cracking the LinkedIn Code 3.0. Bonus #2 – Search engine optimisation training. Beginners guide on how to structure your blog posts and optimise for keywords. Runs for 20 minutes and covers the basics. Needed some information on keyword research to be truly useful. Bonus #3 – Companion Workbook. This is a fantastic 32 pages of exercises, worksheets and templates to implement the advice from the book including your social selling playbook. It’s an excellent resource and really useful especially if you have the Kindle version. Dodoro shows you how to create a reliable system that grows your network, generates leads and drives revenue and pull it all together into a Social Selling Playbook. It’s simply brilliant and a lot of fun to put together. This is one of the standout features of the book because it teaches you exactly how to implement what you’ve learned. LinkedIn Unlocked may be a book on social selling, but the emphasis is not automation. In other words, the road to success is paved with relationships, not connections and provides everything needed to lead with value and get results. 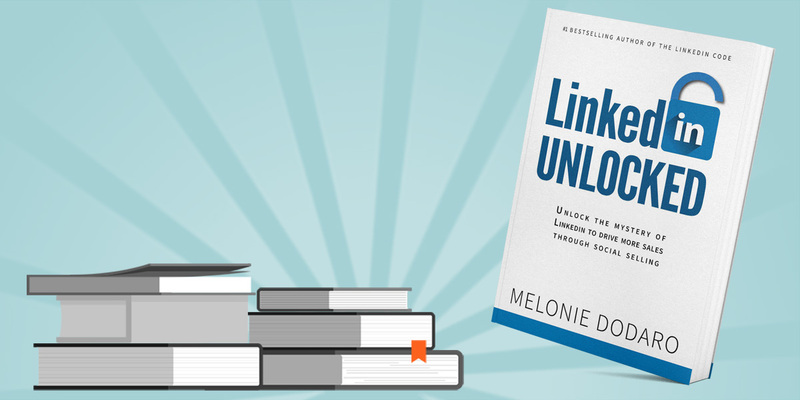 Have you read LinkedIn Unlocked? Let me know your thoughts in the comments and visit Goodreads for other popular LinkedIn books. While LinkedIn is the #1 social network for B2B businesses and lead generation, there will be times when you simply don’t have the time, energy or need to actively be using LinkedIn. LinkedIn is the ultimate business platform with over half a billion global members and counting. By design it helps you find, connect and build relationships with your target audience which might be colleagues, clients, prospects or mentors. Awareness. Identify your goals, create and curate relevant content that establishes credibility and expertise and gets you noticed. Lead generation. Identify and connect with the right prospects. Above all, you must engage with them regularly to move those conversations offline. Create a social selling playbook to systematise your strategy. “Everyone is not your customer,” says Seth Godin. Who are your best clients today? Collect details about your top clients and then bring the best elements of these into an ideal client profile. Describe the problems and challenges they face. What are the risks if they don’t solve these problems? Why haven’t they solved them already? How will their business improve when they do find a solution? What would that solution look like? Identify your goals for LinkedIn. How you will measure success? (for instance, number of followers, number of connection requests, number of calls, revenue generated etc). A professional and compelling profile that represents you and speaks to your target audience is essential in order to stand out and make a good impression. Ask yourself, when reading your profile will your ideal client realise you might be the solution they’ve been looking for? Answer the question: what’s in it for them? Explores each of the sections in your LinkedIn Profile and how to optimise them. Thorough discussion of how to use LinkedIn to grow your professional network including templates. After someone accepts continue the conversation with a welcome message. Focus on relationships not connections. Respond promptly – treat LinkedIn messages like any other communication. Lots of advice on how to nurture relationships and the types of posts that enhance your personal brand. Look for prospects. How to use search effectively to find relevant prospects and expand your network. Initiate a connection. Personalise your connection request. Nurture a relationship. Advice on establishing rapport and engagement to build trust and credibility. Kick up the conversation offline. This is when you learn a more about their challenges and have the opportunity to convert a prospect to a client. Examines the power of personalisation and the value of sharing relevant content with prospects and customers. Explains each of the steps in detail along with examples and templates for each. A useful guide to fifteen trigger events and how to use them to message connections on LinkedIn. These include people that viewed your profile, mentioned you, changed jobs or liked, commented or shared your posts. In addition, examples of how to follow up when your prospect says “YES” and when they say “NO”. A good content marketing strategy earns trust and credibility and position yourself as an expert on your chosen topic. Contributing relevant content engages your network and demonstrates you know your stuff. Even better, make it all of these and align your content to the B2B buyers’ journey. Awareness. Blog posts, info graphics, social media updates and email newsletters. Retention. Podcasts, blog posts, live streaming. Advocacy. Share content, referrals, webinars. Add your point of view. Frame it with a question to encourage comments and engagement. In addition, there’s a wealth of resources on how to find and curate content. Examines how to build your tribe and grow your engagement on LinkedIn and other platforms. In addition, how to collaborate with others to leverage influence and why you must be intentional and commit. Dives deep into ethical marketing and building trust online and approaching LinkedIn with an abundance mindset. Consolidates all the previous chapters into a system of daily and weekly activities for success on LinkedIn. A complete template to create a social selling and content marketing playbook and calendar that works for you. Advice on how to be more consistent and which social selling metrics to track such as number of leads and number of offline conversations and many more. A detailed review of the different levels of LinkedIn membership. Search is the biggest limitation of free membership. Any advanced search functionality requires paid membership. Sales Navigator is an excellent research and engagement tool, but the cost may be prohibitive and innovation is slow. Brief discussion of third party tools like Dux Soup as alternatives to Sales Navigator. Social selling works because it creates trust and builds relationships. Similarly, like any relationship, it needs attention for it to flourish. The foundation is built on relationships and high quality content. It’s the key to closing deals and examines a number of studies and statistics that confirm why social selling is an integral part of the new sales model for the 21st century. In addition, discusses common mistakes why social selling may not be working for you and how to fix them.